In case that selected forward overlap is too high or the estimated Ground Speed of the aircraft is too high, a Groundspeed Warning message appears. This Warning is related to a 3 second camera interval, doesn’t matter about the performance of the currently selected camera. The calculator still shows you the correct estimated camera cycle, e.g. 1.4 seconds. Depending on the performance of the camera, shutter and storage medium, may shorter cycles/intervals possible. Please refer to your manufactures data sheet and experiences. Ground Speed Warning appears now in bold red color. 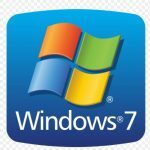 What is the .NET Framework ? Input your desired values into the yellow boxes, e.g. the requested GSD (Ground Sampling Distance) and press CALCULATE.All yellow marked boxes are input fields, so you may change the values to your needs. 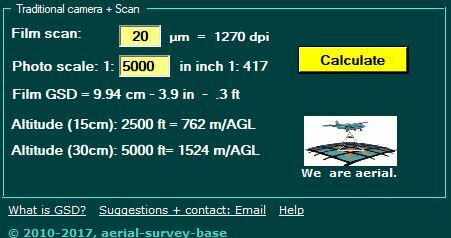 the altitude of flight for the selected camera above Ground (AGL). 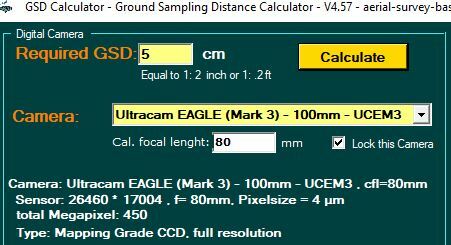 It also compares to the photo scale on a scanned aerial film based on a 20 µm & 12.5 µm scan. „Product scale“ is the final scale when the digital image is displayed on a computer screen, as used for quality inspection in the flight department or finally in the restitution department. The middle section of the screen will show covered area and swath related information. You can change the overlap values (yellow box) to your required overlap. 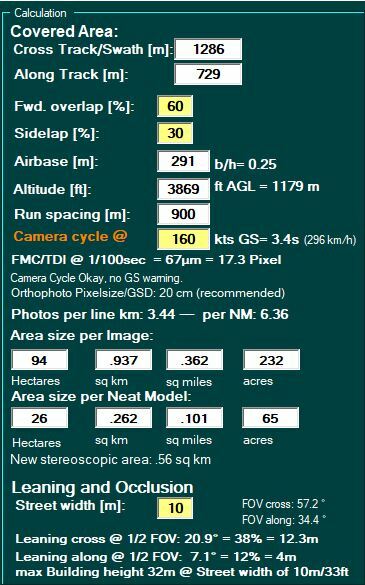 According to the speed of the aircraft (Groundspeed GS in kts) the software checks for the camera cycle. In case your camera has a cycle longer than 3 sec. you may have to take care in-flight about speed, reduce Groundspeed etc. Note: Groundspeed includes the influence of head/tail wind – Airspeed (IAS, TAS) not. You will also get information about Forward Motion or Image Motion. In case your camera has no Forward Motion Compensation FMC (or TDI) the image quality will be reduced because of image smear. The Image Motion is a function of Groundspeed and Altitude (scale/GSD). 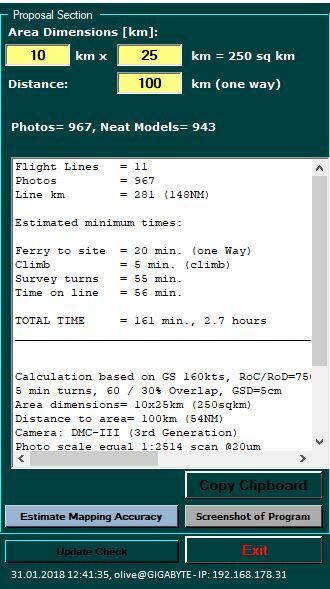 For quotation purposes, the number of photos per kilometer or Nautical Mile is on display for persons who make the quotes according line kilometers and/or number of images. Area sizes per image are calculated for the image and for the stereo model and will provide an idea how much area is covered by a single photo or stereo model. The right hand section is designed to make a brief proposal. You can input in the yellow boxes the area dimensions of a rectangular area to be photographed and also the distance from your airport of operation to the target area. 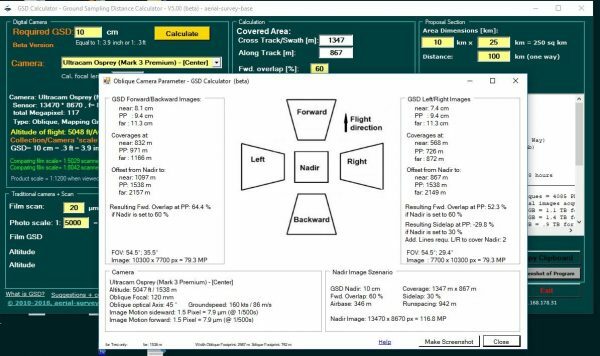 The white section will provide an overview about the amount of flight lines and photos, distance to the area, and will estimate the amount of flying hours you probably need to cover the area of interest, based on the selected camera and Groundspeed of the aircraft. COPY TO CLIPBOARD allows copying the content of the calculation into the clipboard for further use in Outlook, Word or other software. SCREENSHOT of PROGRAM sends a copy of the screen to the clipboard for further use. ESTIMATE MAPPING ACCURACY will display the estimated mapping accuracy achievable from the selected GSD, camera and other parameters. In normal operational conditions, the accuracy will be less or degraded. In other words: Your result will be less accurate than this estimation in operation. The accuracy, especially in z (height) is related to a variety of surrounding factors. The accuracy is of course related to the instruments you use, but not only. For example, a DMC or UltraCam, an Applanix POASAV or IGI AEROcontrol will provide about the same accuracies under laboratory conditions. In a survey flight, the accuracy is much more related to other factors, for example the way how to make survey turns, the distance to a GPS reference Station, how to process the data using GPS post processing software, cycle slips, Ground Control Points, flight line layout, atmospheric conditions and much more. UPDATE CHECK will look if there is a new version available on our server. The left hand section gives an idea about the same parameters when using a traditional camera in terms of photo scale and scanning pixel size. If you have a camera with interchangeable lenses, you may want to use different focal lengths. That function can be used also with all medium format cameras.